I was one of those horse crazy kids riding any horse I could find. I exercised polo ponies, jumped fences, rode dressage and spent days wandering the countryside with my horses. There were blissfull times in high school and college that I had whole barnfulls of horses to ride and learn from. My teachers included members of the US Equestrian Team, two PolishCalvery Officers and most of all my horses! I follow the work of Carolyn Resnick, Robin Gates, the Parelli's and Walter Zettle. In 1998, I re-entered the horse world with the purchase of a headstrong throughbred mare who pushed all my buttons, including the new button: fear! I began to more fully understand why it was so important to train a horse from the ground first, especially if you wanted a safe, responsive and relaxed horse! Of course, the old masters had always know this! In 2002 I was given a free lease on a Dressage Schoolmaster, a former Olympic horse. When his owner commented on the fact he had never been easier to ride, never been as light and responsive, never seemed happier, never before had enjoyed even being brushed, I felt I was on to a new way of being with horses. Horsemanship is a journey of self-discovery! Mustangs from the wild were the next stage of my Natural Horsemanship journey. They have taught me the most about horses: watching them play, gentling them, sharing space with them, gaining theiir confidence through playing on line and at liberty, and starting them under saddle. 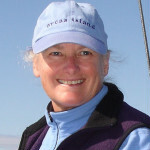 "When you were working with Polly you were so present with her each day, clear and thoughtful about how each lesson would unfold. Your enthusiasm and love for what you are doing permeates the lessons. Your warmth and gentle, yet firm approach to what you are teaching is indeed a gift!" My training methods are always gentle and proceed in small steps in order to create a solid foundation for both horse and student. In order for horses or students to learn, they must first feel safe and relaxed. Learning horsemanship will require patience, respect for the horse and focus. It will teach you about yourself and enhance your leadership skills. It's both a meditation and a dance. 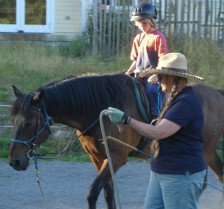 Many traditional horse programs emphasize a method of communication that requires the horse to step into our human perspective, expecting them to learn our language, our ways of learning, and meet our needs. Kate's Natural Horsemanship is the opposite in that it approaches horses in a way that is respectful of their culture and sensitivity. Approaching the horse with curiosity, we can learn to play by their rules, and develop the qualities within us that horses are naturally drawn to. Instead of dominance and submission, I teach partnership, connection, mutual understanding and clear communication. These are the ingredients for a trusting relationship with your horse and a foundation for ultimate success. There are many steps prior to riding! 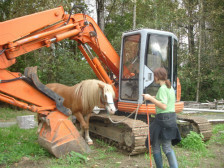 Good ground skills and horse psychology is the best way to be safe with horses. establishing good boundaries and mastering the seven games are the skills needed prior to riding. New and uncertain riders will begin their riding on the lunge line to develop thier seat, as they do at the Spanish Riding School. My goal is to teach better communication skills that result in softer interactions and more williningness in the horse. 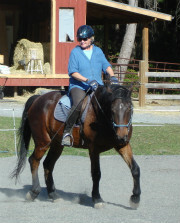 If you are needing help with ground skills or trailer loading or learning lower level dressage, if you are interested in Natural Horsemanship from the ground and in the saddle, I can help.